Christmas season is almost here and if you have ever spent the holidays in the Philippines, you might have an idea about how Filipinos love celebrating the season with genuine enthusiasm and unending excitement – and they won’t hesitate to show it through their colorful decorations, vibrant Christmas lights, and of course, their most delectable and savory dishes. In fact, the country’s culinary culture offers a wide variety of delicious and colorful holiday cuisines that make the event extra special. Here are the top Filipino Christmas foods that are always present in every Pinoy Christmas table. Puto bumbong is an icon in the Filipino Christmas holidays and it’s a breakfast staple for people who go to church to attend the Misa de Gallo, the Catholic mass held during the early mornings before Christmas day. 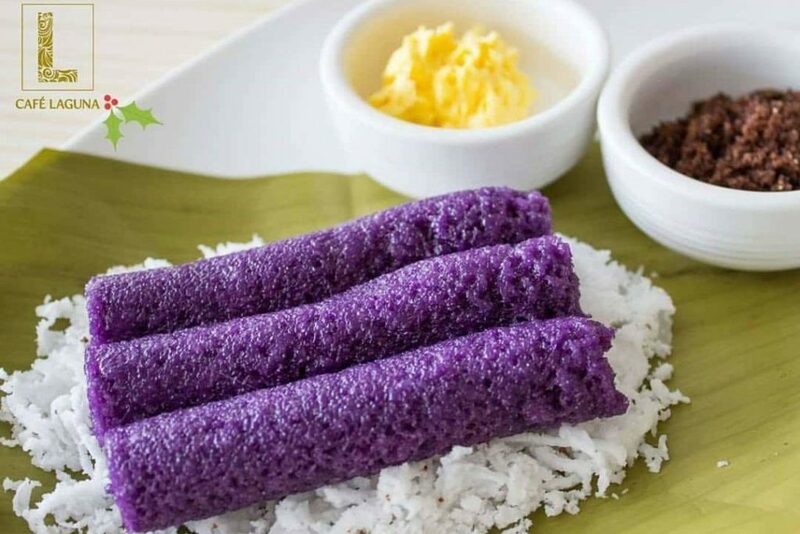 The dish is a type of purple rice cake that is baked inside a bamboo tube. It is served on a pre-cut banana leaf and then topped with other ingredients like butter, thin strips of coconut, and sugar. 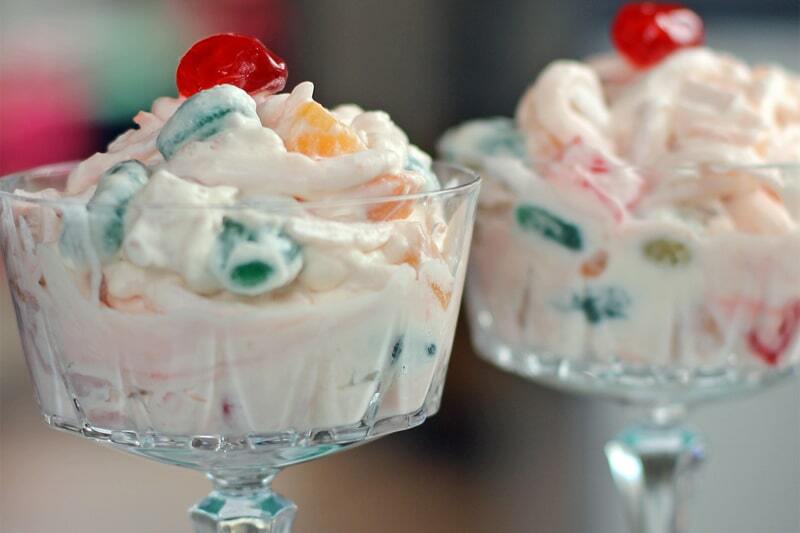 Perhaps it’s the colorful characteristics of fruit salad that made it one of the top Filipino Christmas foods prepared during the holidays. The dish is basically a combination of different fresh fruits like cherries, pineapple, apple, mango, jellied coconut, raisins, and more. Cream and condensed milk are added to help the different flavors come together. It is served as a dessert or an appetizer for guests. It can be a highlight of a Christmas dinner or a surprise for balikbayans (returning overseas Filipino workers) who went home for the holidays. 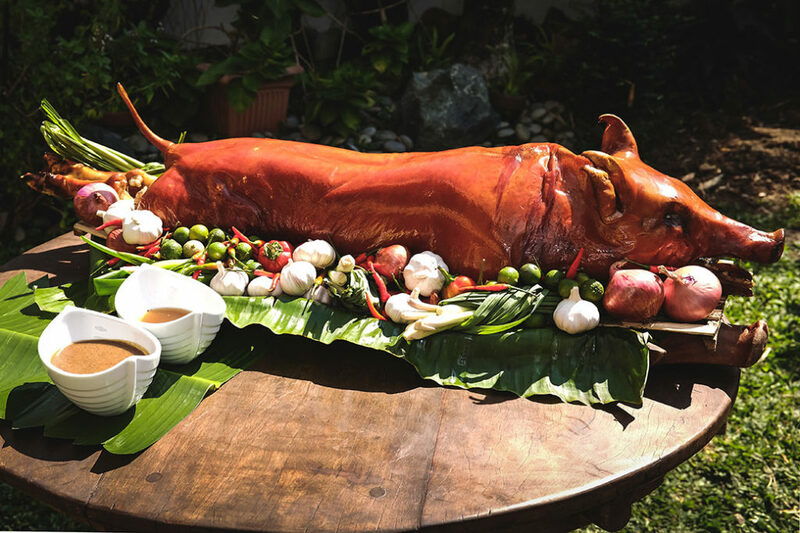 Roasted whole pig is no stranger to Filipino celebrations and in Christmas, preparing this very special food makes family members excitedly look forward to Christmas every year. One whole pig can feed an entire family, but the best thing about lechon can be experienced after the holidays. The leftover roasted pig can be re-cooked and transformed into a Filipino after-holiday favorite: lechon paksiw. Basically, it’s chopped meat that is slow-cooked in the concoction of coconut vinegar, garlic, onion, and seasoned with salt and pepper. The dish is a reminder of the enduring Spanish influence on Filipino cuisine and festival celebrations. This very special Christmas food, however, is not that easy to make because of its long list of ingredients including fresh seafood. Preparing paella in earlier times signifies the wealth of a family or clan because the ingredients are usually expensive. 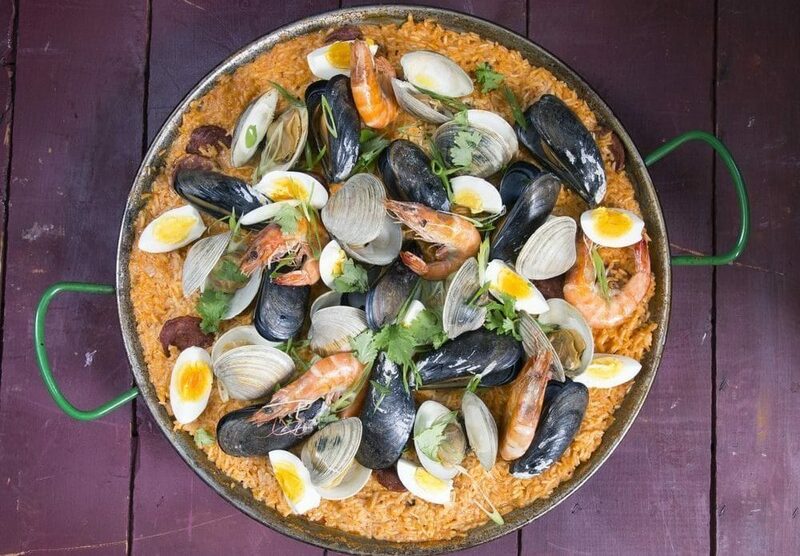 While it’s still true nowadays, anyone with the recipe and the ingredients can experience the delectable and unique flavors that paella has to offer. 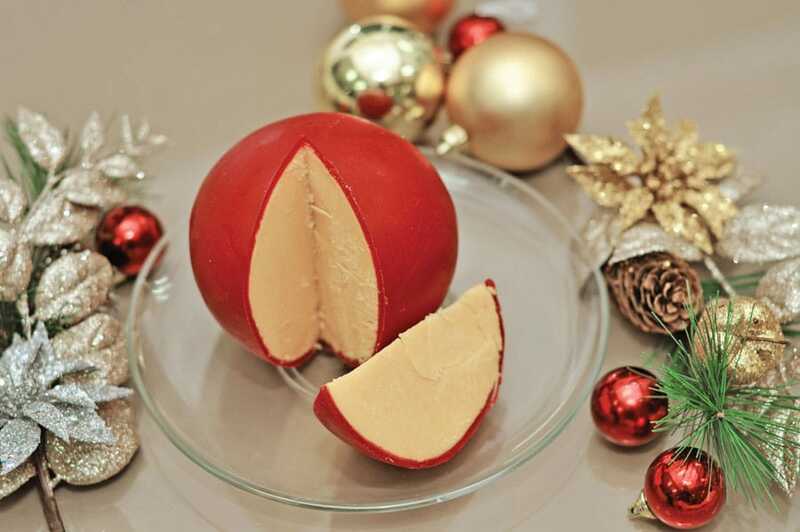 Literally translates as a “ball of cheese”, keso (or queso) de bola is a staple Christmas food for Filipinos all over the country. This particular cheese variety does not have a strong flavor like its other cousins. However, just like other types of cheese, it’s creamy and salty. It also has a unique sweetness to it – and its appearance is also one-of-a-kind: it’s covered in red, edible wax. 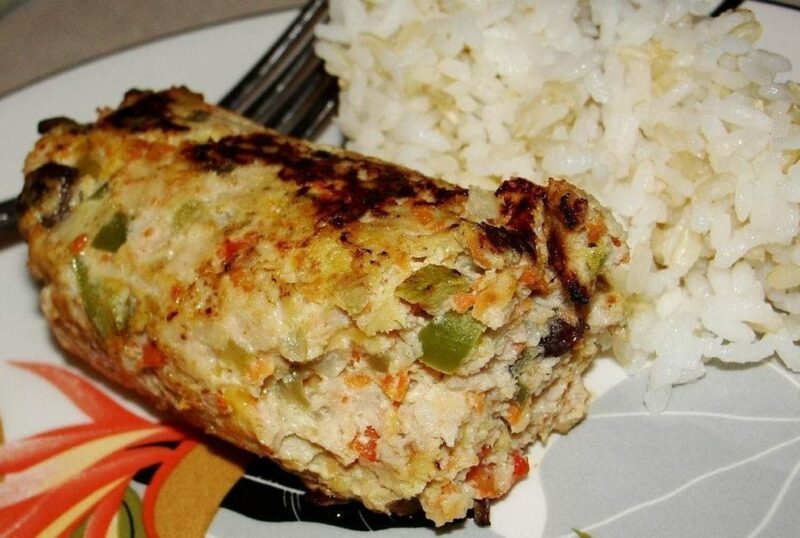 Basically, this Christmas food is a Filipino-style meat roll. 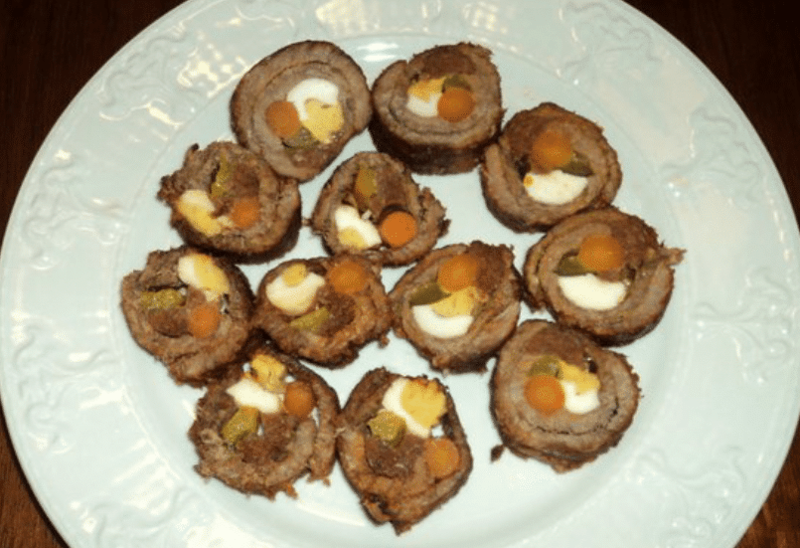 However, unlike other meat rolls, it is stuffed with ingredients like hotdogs (some use sausages), pickles, carrots, hard-boiled eggs, and cheese. Morcon can use red or white meat, depending on the preference of the family. Chicken and beef, for instance, are perfect for a Christmas morcon dish. Embutido is a local name for the Filipino-style meatloaf that is often prepared during special occasions like town fiestas, birthdays, weddings, and most importantly, Christmas. Just like any meatloaf, it is made of ground meat, added with other ingredients like carrots, raisins, cheese, garlic, etc. Aside from the fact that it is easy to prepare, it does not take a lot of effort to cook embutido (bake or fry). Moreover, several commercial meat vendors even offer pre-made embutido so you won’t go through the hassle of starting from scratch. 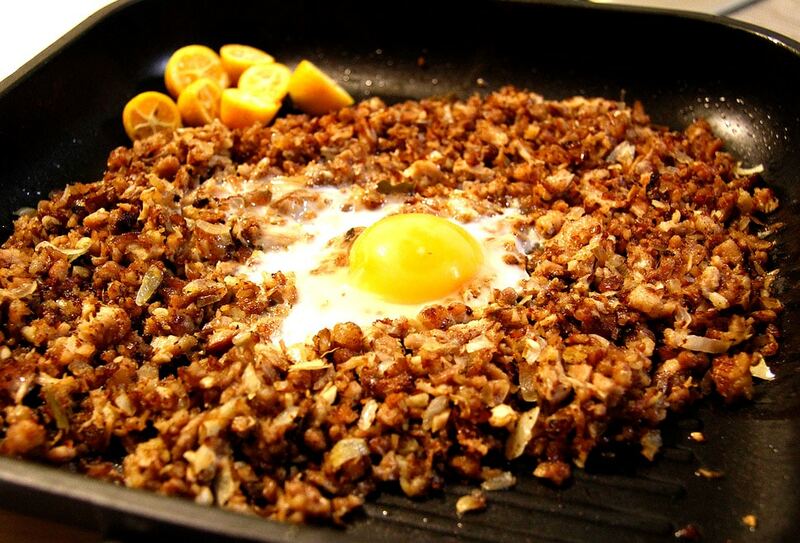 Filipino Christmas isn’t complete without a bottle or two of beer after a filling Christmas meal – and this is where sisig makes the after-party a memorable one. The dish is made up of chopped pig’s cartilage (usually cartilage and meat from lechon’s head) and mixed with onion, green chili, and topped with a raw egg for mixing. It is served on a hot plate to achieve a sizzling effect and to also cook the egg. Leche Flan is one of the most popular Filipino desserts and is also a top item in the list of the most delicious Christmas food in the country. It is made with ingredients that you can easily find in the kitchen: eggs, milk, and sugar. 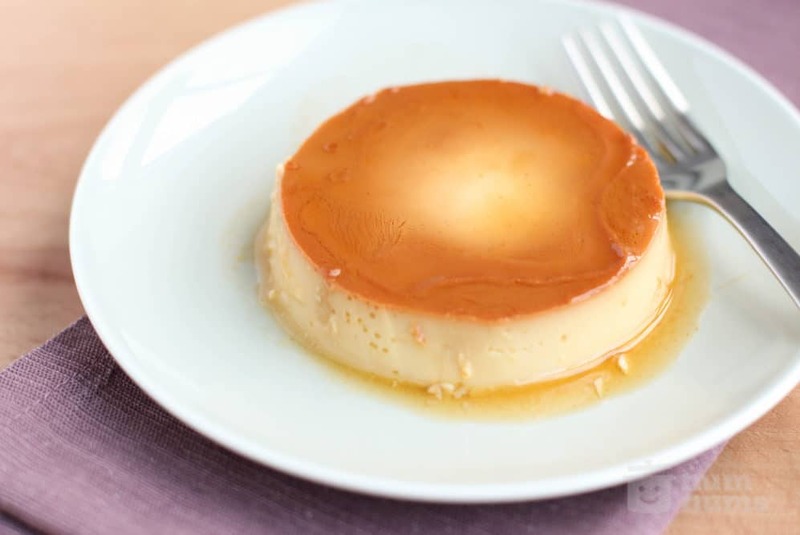 Leche flan is like a Filipino version of the European crème caramel. It is basically an egg custard with a soft caramel on top. Unlike other Filipino desserts, it is easier to make and it usually has a longer shelf-life so it can just be stored in the fridge even after the holidays. 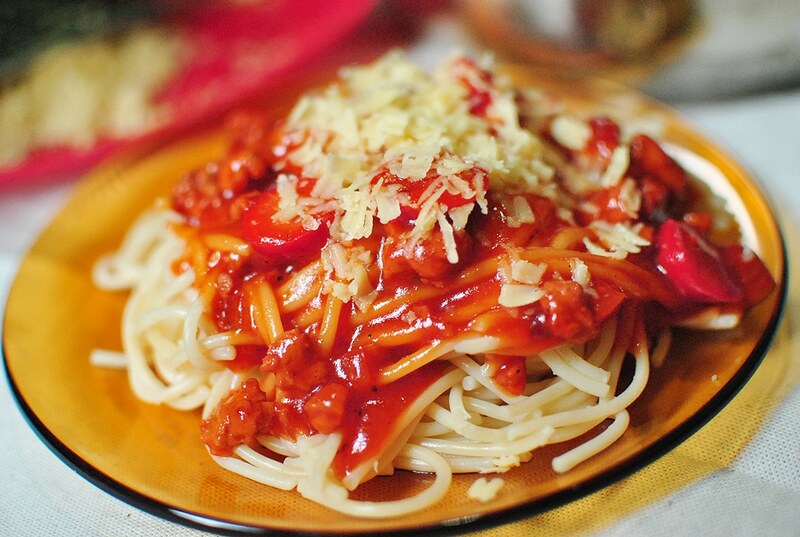 Spaghetti is the most popular pasta dish in the Philippines. It is a tomato-based pasta and is often topped with grated cheese. However, unlike the Italian pasta, it has a distinctively sweet flavor and because of this characteristic, it is a favorite for kids. Pinoy-style spaghetti can be served with meatballs or even chunks of hotdog (red sausages). While it is tomato-based, other preparations include adding condensed milk for a creamier and sweeter flavor. Filipino-style Christmas hams are sweet because they are glazed with pineapple syrup. After reading the previous items, you probably now have an idea that Filipinos love sweet dishes – and this particular variety of ham served during the holidays is no exception. 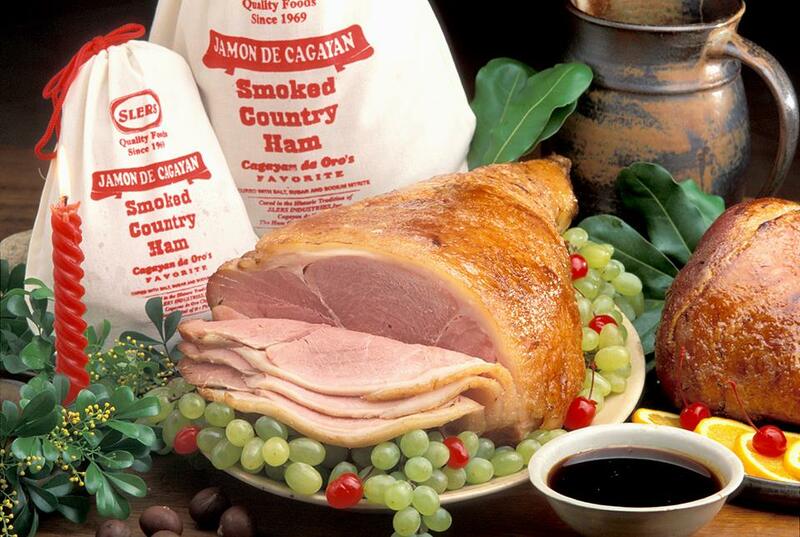 Hamon, as what it’s called locally, is served during Christmas and New Years. While other families have their own recipes, commercial meat companies offer pre-marinated ham for those who don’t have the time to prepare this special dish. The Philippines has the longest Christmas celebration in the world and most foreigners who were lucky enough to celebrate this very special occasion in the country can agree that it’s one of the best – because of the great food and great company. Have a wonderful holiday season and make sure to try one or two Christmas dishes from this list!